“Dr. 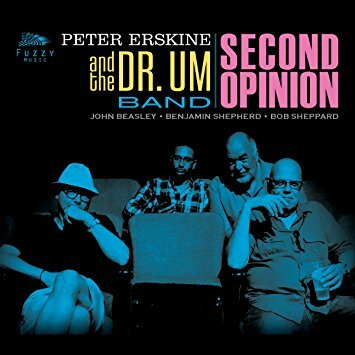 Um Second Opinion” on Fuzzy Musicis a follow-up to Peter Erskine’s Grammy®-nominated “Dr. Um” album. It reunites the production team of Erskine with Grammy-nominated keyboardist and arranger John Beasley. “Second Opinion” is just that: a new look at songs and genres that are ripe and begging for expert musical attention. From funky originals to Henry Mancini covers, the Dr. Um Band delivers! Erskine has played drums since the age of 4. He has appeared on more than 600 albums and film scores, won two Grammy Awards plus numerous Grammy nominations, and been voted ‘Best Jazz Drummer of the Year’ ten times by the readers of Modern Drummer magazine. Peter doesn’t have a tasteless bone in his body, and when it comes to style, in any genre, his feel is right on the money. Through four decades and counting, Erskine has been associated with some of the biggest, baddest bands in the jazz and rock worlds. You name it… Weather Report, Pat Metheny, Joni Mitchell, Jaco Pastorius —should I go on?